We have smart phones, smart houses, smart cars… but what about a smart wardrobe? In the digital age, convenience and efficiency are as much a part of life as a great pair of jeans. The best and brightest minds of our generation have a pattern of paring down their wardrobe to maximize efficiency and productivity, yet, despite this push for functional, fashion-forward menswear, shopping for clothes hasn’t gotten much easier. Meet ThreadLab. This New Jersey-based men’s clothing service start-up wants to keep you out of the mall and instead, doing what you do best. Unlike the other guys, ThreadLab is not for fashionistas. You won’t find any stylists or long, tiresome phone consultations here. Instead, the team at ThreadLab focuses on a simple, seamless ordering process to source high quality, trustworthy brands that are functional and just fit. ThreadLab – Ultimate Convenience. A life hack for busy guys. 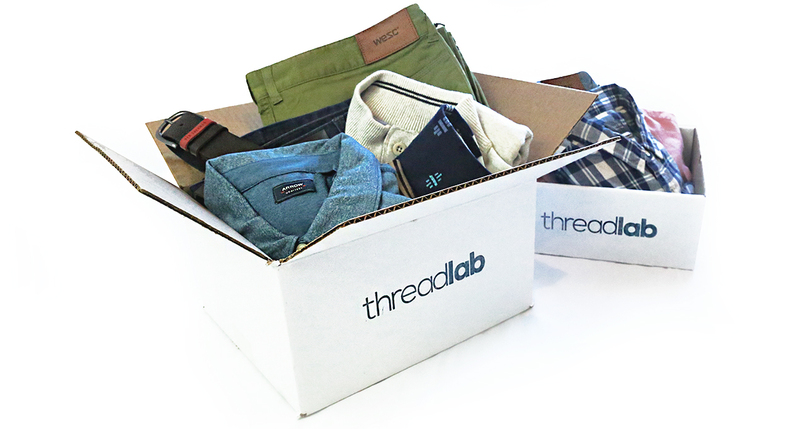 ThreadLab wants to take the hassle out of men’s shopping. Using their Perfect Fit™ algorithm, you can easily set your style preferences (graphic tees or button-downs? Jeans or Chinos?) and your clothes will be custom-picked based on your selections. What do I get with ThreadLab? ThreadLab works for busy guys who want the convenience of looking good without the hassle of going to the mall. Think of it as the foundation of your wardrobe; they handle the important things, the things you actually need – like a good pair of jeans and a nice button down. You simply set your style preferences when you sign up and they do the heavy lifting. Pricing is flexible – $59, $99, $149 or $299 per shipment with options for on-demand orders and subscriptions. At ThreadLab, we don’t tell you how to dress. We simply take the expansive, often overwhelming universe of men’s apparel and break it down to a manageable subset of products and brands that will fit your body, budget and tastes. 365 Days to Return – Most clothing services give you 3 – 10 days to return. No hassle returns is a huge plus. Order Previews – See a preview of the items that you can edit before they ship. No Commitment – Subscription is optional and there’s no lock in. Order whenever you feel the need. Flexible Budget – Control your budget at the item level and the order level. No sticker shock. Ever. Mission Driven – A catalog that includes eco-friendly brands and American made brands. Shop easier – and better. ThreadLab is a USA based company that ships worldwide, 365 days a year. If you have questions about ThreadLab or would just like to get to know us, please tweet to us at @mythreadlab or DM us on Facebook!